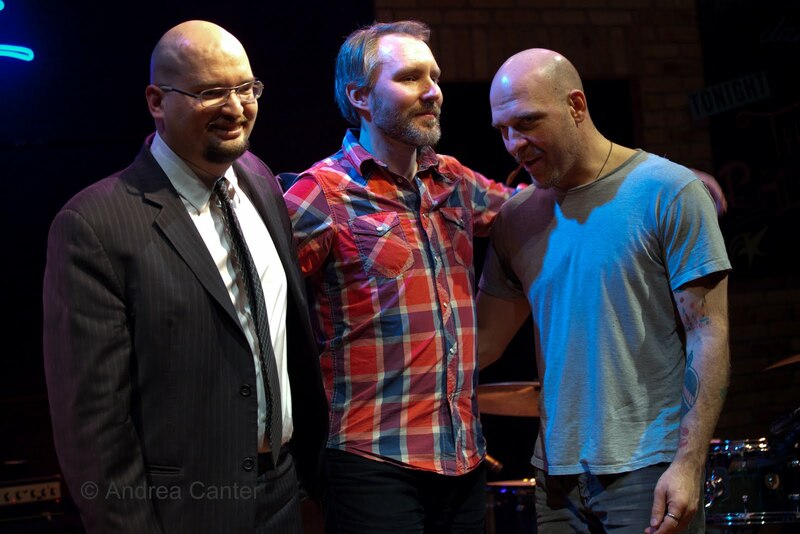 One of the hallmarks of the Bad Plus is the equity of their long-standing collaboration. But the fact that there isn’t one star among the trio hardly means these musicians lack star power. Rather, it’s the merging of the three audacious talents that yields a supernova. And that galactic phenomenon never shined more brightly than in last night’s performance at the Loring Theater of “On Sacred Ground: The Rite of Spring.” Or on the set of original works that followed, proving that with TBP, there is no such thing as anti-climax. In reconsidering Stravinsky’s legendary orchestral score as an acoustic trio venture, TBP revealed itself as a sustainable energy source. For 40 minutes, ranging from the most delicate whisperings to sudden ballistic uproars to impassioned swells, Ethan Iverson, Reid Anderson and Dave King brought together elements of all musics, all eras—their “Rite” is the penultimate cross-over. They neither abandoned Stravinsky nor their own penchant for reinterpretation in a 21st century, let-it-all-hang-out context. Whereas the first performance of “Rite” prompted riot and debate in 1913 Paris, no doubt this new “Rite” prompted viral conversation and dissection via Face Book and smart-phone in 2011 Minneapolis. Yet, so spellbinding was the presentation last night that at least this reviewer finds words of little value in conveying the impact of the music. From the first notes, this was at once unlike any Bad Plus project to date and filled with Bad Plus signatures. Iverson’s introductory piano solo immediately focused all ears on the simple and haunting lines of melody, each note so carefully chosen to compliment the last and prompt the next, while effects from inside the piano (or beyond) suggested an old recording superimposed on the house concert grand. Anderson and King engaged in subtle experiments of a similar nature, disguising the build-up to a sudden crash. It’s hard to replicate a string session with just piano, bass and drums, but TBP expanded its sound to that of a much larger ensemble, piano and bass often suggesting the harmonies of horns, the intensity of King’s drumming a sufficient drive train. As they moved through each segment, panels of light and projections of often-ambiguous images augmented (and at times distracted from) the music, a visual choreography designed by New York architect Cristina Guadalupe and filmmaker Noah Hutton. Some reviewers describe this new “Rite” as a “rock show.” That is far too simplistic as well as incomplete. Indeed there are rock elements, as there always will be with a drummer like Dave King, who merely needs to look at the bass drum to elicit thunder. And as with other BP repertoire, there are classical, blues and of course jazz elements that conspire with relentless percussion, yielding dizzying sonic assaults, tender balladry and quirky dances, often within the space of a few bars. Stravinsky’s ballet was primal, violent, beautiful and dissonant. Nearly 100 years later, the same adjectives describe its reincarnation by TBP. The second half of the program might have appeared unnecessary save the general jazz practice of two sets per show. How can you serve a worthy dessert after such an entrée? Ever the iron chefs, the trio returned for a set of original and largely popular compositions, played as if for the first time. If there was any concern that the lengthy “Rite” would leave little energy for TBP’s trademark execution, it was unfounded. Perhaps the only thing missing was the usual level of whimsy—they were still “on sacred ground.” Reid Anderson’s “Giant” with his elongated solo was bigger and more spacious than ever; Ethan Iverson diddled as if playing a circus calliope on Dave King’s “The Empire Strikes Backwards,” while his own “Cheney Piñata” was a folkloric fiesta of rhythms that built to a vamping piano/bass accompaniment for a demonic King. After a majestic parade around King’s “Anthem for the Earnest,” we were treated to the evening’s second breath-taker, a new one from Anderson titled “In Stitches.” The evolution of this composition –a solo drum intro that hinted at “Peer Gynt” to a funereal piano/drum pairing that moved into a romantic ballad, to the steady build in intensity that suddenly broke free as three separate vamps collided, followed by the recession into droning bass, retreating ballad, and feathery bass finale—could only come from artists willing to tackle orchestral epics. Having taken those first epic steps “On Sacred Ground,” we have to wonder, where will the muse take The Bad Plus next? Clearly there are no boundaries—to their repertoire, to their imaginations, to their physical and creative energies.